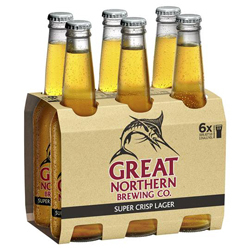 Great Northern Super Crisp Lager was designed with an easy going lifestyle in mind. With its mild fruity aroma, subtle bitterness and refreshingly light finish its brewed specifically for the Australian climate. Thought I would have to go without Great Northerns while living abroad. Couldn't be happier! Ordered on a Wednesday afternoon, they arrived just in time for Beer O'clock on Friday. My husband love this drink when we was in Australia last year for his 50th Birthday and visit relatives been looking for somewhere that sold it he is very happy . Very fast delivery ordered Saturday got it Tuesday morning he now can't wait to have a drink of it . Best lager, ever. Comparable to Corona, but much nicer. The only beer I ever bought when I was living in Mackay, Northern Queensland.